When it comes to your SumTotal LMS user interface, the same fact rings true no matter what industry you’re in or who your learning audience is: standard, non-customized interfaces don’t make the cut anymore. Templated, basic, feature-less LMS user interfaces leave learners feeling bored, unmotivated and disengaged across the board. The importance of customized user interfaces and LMS dashboards is something we talk about a lot here at Earthly, and there’s a good reason for that. Why? Because it’s so important. Delivering learning in a way that speaks to your learners and presents them with something familiar, user-friendly and engaging is absolutely essential… and the best way to achieve that is by developing a customized user interface. In this post, we use the healthcare learning industry as a specific example but bear in mind that a lot of these suggestions can be applied across the board, regardless of industry or sector. Get in touch with us if you’d like to chat more in-depth about how these customizations can be applied to your organization and its learning goals. 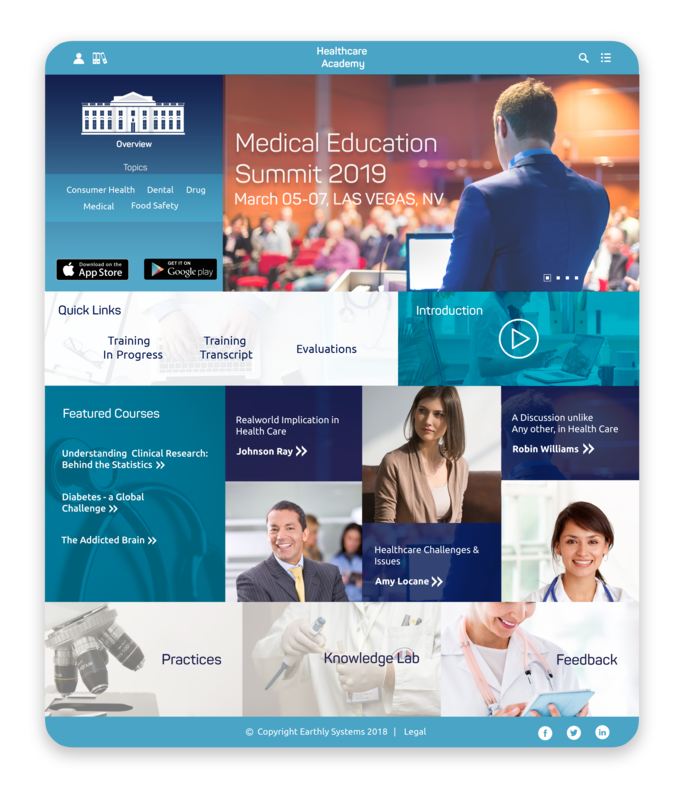 Healthcare academies, including healthcare universities or learning divisions of leading healthcare bodies, often use an LMS as a means to help practitioners share knowledge and earn continuing education (CE) credits. However, many of those LMS aren’t being used to their fullest potential. They’re left basic and non-customized, delivering a bad user experience and resulting in low repeat visits. Simply put, learning managers are investing tons of time, energy and money into building an LMS that learners take one look at and then abandon it. This is undoubtedly a frustrating but common problem – and one that can be remedied with a little bit of customization. By customizing your user interface, you’re driving a deeper connection with your learners and showing that you have their best interests in mind. Customization allows you to present the information they need when and where they need it, while also giving you an outlet to target groups of learners with specific messaging or content. It’s a win-win situation. What is a customized user interface? SumTotal user interface customization is exactly what it sounds like: it’s the process of customizing the user-facing elements of your SumTotal LMS. It involves everything from your visual identity to data reporting and helps you ensure branding and organizational consistency within your learning platform. Customizing your user interface goes far beyond just branding it with your company’s colors, fonts and logo. It’s about developing something that is tailored to your learning initiatives and that delivers unique learning value to your users. It takes into consideration your organization and its brand, your learning program and its intended outcomes, and your learners’ needs. The changes can be reflected in your courses, whether they are CE credit courses of product knowledge courses, as well as on your learner homepage dashboards. Why does your healthcare university need it? Engaging in user interface customization is a great way to boost learner engagement, increase repeat visits and ultimately generate greater knowledge retention. Healthcare universities in particular often have a huge amount of valuable knowledge resources across other platforms – some hidden in plain sight on their websites, others hidden away in email inboxes and faculty projects. By taking these resources and making them available in a customized, user-friendly LMS, you’re going to deliver a superior learning experience and make better use of the content you already have. In other words, it’s going to help you stop reinventing the wheel. The result? More engaged learners who actually access the information you’re putting out there, leading to better-equipped practitioners and the actual fruition of your learning goals. To make the process seem a little clearer, let’s look at a visual example of a customized user interface. Below is a sample mockup of a user interface for a healthcare academy. Let’s imagine the academy was created as a means for healthcare professionals to earn continuing education credits and share knowledge among industry thought leaders. It promotes bite-sized learning, live events (like webinars), tailored learning paths, and the ability to learn anywhere, anytime on any device. Do you think this could all be achieved this through a standard LMS user interface? Of course not. A customized SumTotal LMS allows the academy to deliver the content they want to deliver, while also increasing its brand value through direct, obvious links to the corporation and its brand. Every detail you see is intentional, geared towards making an engaging and enjoyable experience for the user. Let’s look at each of the customization options in detail. Custom branding: How can you apply your corporate brand to your customized SumTotal user interface? If you’ve had any experience in marketing, you know that one of the key aspects of a good brand is consistency. 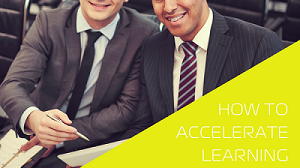 Unfortunately, many learning managers fail to make that connection when developing their LMS. When creating an LMS, it’s important that the branding be similar – if not identical – to your corporate website. This kind of consistency allows a learner to make a more immediate, stronger connection between the learning content and your organization. When a user is learning within a branded user interface, they are unlikely to forget that the LMS they’re using is associated with that particular institution or company. The logo appears at the top of the page, even when you navigate away from the homepage, the fonts are consistent, and the company’s messaging (like its mission) is transmitted throughout the LMS content. When helping organizations customize their SumTotal LMS, we ensure that the design incorporates everything from their colors and fonts to their language and tone of voice – while also ensuring usability and attractiveness. Custom news pages: How can I present customized content to my users? A hugely advantageous but hugely underused customization feature of your SumTotal LMS is the news page, or news content is on the homepage. When customized, this section of the LMS offers a place to share custom content based on the user’s role or active mode. As a healthcare academy, you could offer up different content to a nurse, a doctor, a dentist, or any other healthcare practitioner based solely on their role and the learning programs he/she would be most interested in. The key benefit of this is that learners have the exact information they need at their fingertips, without having to dig through content categories or tags to find the programs or resources that are right for them. It also offers you an opportunity to reach groups of people (or even individual learners) with targeted messaging. For more information on this topic, you can read our post on LMS learner dashboards in the healthcare industry here. You can also check out our post on how customized LMS news pages can be used for a more effective onboarding. Custom widgets: What kind of content can be included in a customized user interface? Chances are your organization already has plenty of useful resources for learners just sitting on your website or in various digital files and folders. The great news is that a lot of this content can be built into your SumTotal LMS, no matter its format, through custom widgets. Here are just some examples of what forms of content you can include as part of your customized LMS user interface. As you read through them, think about what resources you already have (or that you may currently be developing) that fit into these categories and might have a place on your LMS. Best practice resources are resources on topics that matter most to your organization and your learners and offer top quality advice on how to address those topics. They are typically specific to a particular skill or issue. These resources typically take the form of an infographic or a video. They can be sourced from industry leaders or even from top performing team members in your organization. For a healthcare university, you might seek topics from your faculty leaders or top lecturers. A custom video widget enables users to browse and watch a playlist of videos. Those videos can be hosted on an external site, like YouTube or Vimeo, or can be uploaded to a private, internal playlist within your SumTotal News Page. Best of all, any new videos uploaded to the playlist will automatically be presented in the widget — no extra step necessary. In the healthcare industry, you may already have videos detailing best practices, patient stories, or unique case studies. With a custom video widget, it’s easy to gather all of these videos into neatly organized playlists for easy viewing directly in your LMS. Want to learn more? Click here to download our guide on custom video widgets for SumTotal. If your organization is already producing a podcast, whether on your own or in conjunction with industry thought leaders or another brand, why not repurpose it as supplemental learning material? Audio files, as well as podcast episode transcripts, can be easily uploaded to a customized area of your SumTotal LMS. Most healthcare academies will have plenty of useful articles and blog posts floating around – after all, this is the kind of content production that goes on most frequently in these environments. From academic journal articles to media articles and guest blogs, it’s important to look for ways to repurpose these knowledge resources within your LMS. Taking your top-rated posts and sharing them with learners within your LMS user interface provides additional value without any extra work. As you can see, there are many ways in which going beyond a standard-issue LMS and customizing your SumTotal user interface can significantly impact the user interaction and engagement within your healthcare university dashboard. If you’re interested in learning more about how these customizations can work for your organization, get in touch. At Earthly, we’re leading experts in SumTotal LMS and deliver user interface customization options that are perfectly tailored to any organization. Get in touch today.